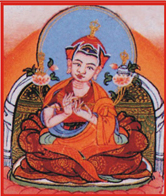 The Nyingtik Lineage: Rinpoche is a master of the Dzogpa Chenpo Longchen Nyingtik lineage. The lineage is described below. Shakyamuni Buddha was fully enlightened from the very beginning, in the form of Dharmakaya Buddha. Therefore, Dharmakaya Buddha was the source of all the Buddhas, Bodhisattvas and teachings. The Dharmakaya Buddha was the founder of Great Perfection. In the state of Dharmakaya, he gave his teachings to the five self-manifesting Buddhas of the Sambhogakaya Buddha, who are the same essence with the transmitted directly to their Wisdom Mind, without using words or any other indication. We call this the Lineage of transmission of the Wisdom Mind of the Buddha. 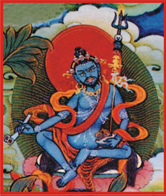 In the state of Sambhogakaya, Sambhogakaya Buddha Vajrasattva transmitted all the empowerments and teachings to the Nirmanakaya Prake Vajra (Gharab Dorjee), the first human master, through the sign, light, and pronouncing a mantra. Here, they don’t teach through regular speech. This lineage is known as Symbol Lineage. 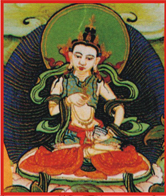 Nirmanakaya Buddha Gharab Dorjee was the emanation of Vajrasattva Buddha. Gharab Dorjee was fully enlightened from this birth and had no need to study or practice. Gharab Dorjee could debate and discuss about anything with the 500 great masters when he was only 7 years old. So no one could challenge through debates or spiritual power. 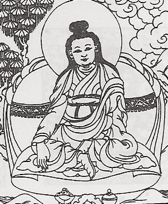 He knew all the Hinayana, Mahayana, and Vajrayana teachings. In particular, he understood the meaning of six million four hundred thousands verses of the Dzogpa Chenpo (Great Perfection) teachings. From his advice, his student, a Dakini, compiled all his instructions into books. 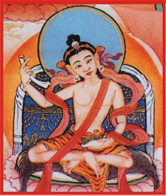 The master himself later became rainbow body and dissolved into the Dharmakaya state. According to the students experience, the master received “great light initiation” (the final initiation) from Sambhogakaya Buddha Vajrasattva and immediately became fully enlightened, the ultimate stage of Buddhahood, and started to teach humans. He was the first human master. 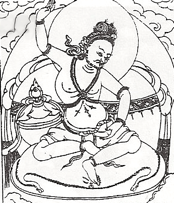 Jam Pal Shes-Nyen, the second human master of the Dzogpa Chenpo great perfection, was the emanation of bodhisattva Vajrapani. Born into a Brahmin family in a city west of Vajrasana, he mastered Philosophy, logic, Sanskrit, linguistic, and art while he was still a child. According to the prediction of Manjusri, he went to see his Dzogchen master at the cremation ground at Sitvana. There he studied for seventy-five years with Gharab Dorjee (Hasya Vajra) and received all the Dzogpa Chenpo teachings, initiations, and innermost secret pith-instructions. 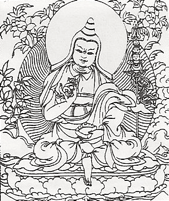 He divided the six million four hundred thousand verses of Dzogpa Chenpo into three sections: mind section, vast expanse section, and esoteric instruction section. Later he got enlightenment and dissolved into a mass of light (attained rainbow body). After that, he reappeared to his best student Sri Singha in a vision and gave him the final instruction and presented him with a box containing the six meditation experience. Great master Shri Singha was born in 289 B.C. in the country known as the Black Expanse, in western China. From age 15, he started studying Astrology, and many other things from master Hastibhala. Also, Shri Singha studied inner and outer tantra from the master Bhela Kriti for seven years in WuTai Mountain in China. Later, when he was in meditation retreat, Buddha Avalokiteshvara appeared and predicted him that if he wanted to get enlightenment within his lifetime, he should go to India and see his master. So he went to India and met great master Jampal She-Nyen and later Nirmanakaya Gharab Dorjee. He spent 25 years with them, and received all the initiations, teachings, and pith instructions of Great Perfection, the Dzogpachenpo. He practiced and became fully enlightened. Later, he became rainbow body and became one with Dharmakaya Buddha. He transmitted his lineage to the second Buddha Guru Padmasambhava, to Vimalamitra, Buddhaguhya, and to Tibetan master Vairotsana Raksita. Padmasambhava, the embodiment of Dharmakaya, Sambhogakaya and Nirmanakaya of the Buddha and Vidyadhara of all forms of enlightened knowledge, transmitted the innermost secret teachings of Vajrayana to Tibet. Through his teachings and empowerments, he established the basis of the Nyingma Kama and Terma transmission and consecrated the land of Tibet. 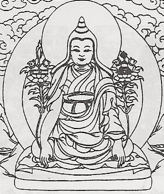 He guided, taught, and protected whoever is devoted to the practice of Vajrayana. He manifested in the ten directions and in the three periods of times, showing different forms and teachings in different cultures to benefit living beings. 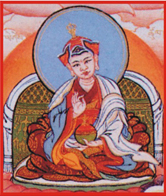 Yeshi Tshogyal was Padmasambhava’s mystic consort and greatest disciple. 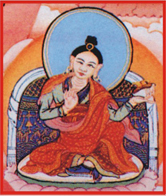 She was the incarnation of Vajra Varahi and was instrumental in the transmission of essential teachings of the Nyingma tradition. 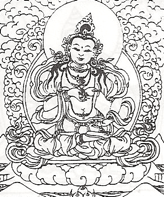 She was also one of the three disciples who received the Vajrakila teaching from Padmasambhava. She practiced and accomplished these teachings. After Padmasambhava departed from Tibet, she continued the teachings and guided many hundreds of disciples. 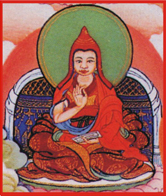 Kunkyen Longchen Rabjam (1308-1363) was the greatest Dzogchen master in the Nyingma tradition, and also the most brilliant and famous writer. He wrote about 270 works, of which only about 25 survived and among which where the “Seven Treasuries” (Longchen Zod Dun) and the “Three Trilogies”. He explained about 17 main tantras of Dzogchen teaching and 9 yanas. 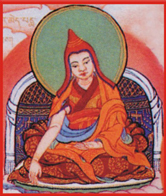 Also, longchenpa collected his own Terma and Dzogchen teachings of guru Padmasambhava and Vimalamitra, which is known as “Nyingtik Yabzhi”, i.e., Khandro Nyingtik of Padmasambhava, the Vima Nyingtik of Vimalamitra, the Lama Yangtik, the Khandro Yantik, and the Zabmo Yangtik of his own explanation of Dzogchen. So he was the greatest exponent if the Great Perfection. His “Seven Treasures” (m Dzod bDun) books are very famous and well known to this very day. 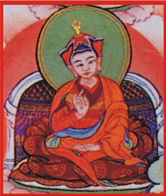 Jigme Lingpa (1729-1798) was the combined emanation of Vimalamitra, King Trisong Detsen and Gyalse Lhaje. He received the complete Dzogchen Nyingtik teachings from Guru Rinpoche, Yeshi Tshogyal and Longchen Rabjam, through the state of pure vision. 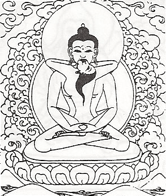 He saw Longchen Rabjam three times and received his blessings of body, speech, and mind. 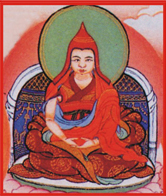 Thus he became inseparable from the Longchenpa and attained the realization of the Dzogchenpo. 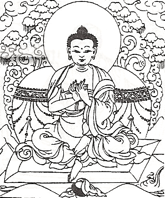 He write nine volumes of “Dharma treasures” (Terma), and became the founder of Longchen Nyingtik. 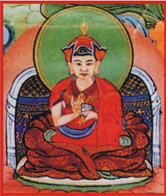 His incarnation included Do-Kyen-Tse Yeshi Dorjee (1800-1866) as his body incarnation, Patrul Jigme Choyi Wangpo (1808-1887) as his speech incarnation, and Jamyang Kyentse Wangpo (1820-1892) as his mind incarnation. 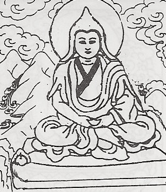 Jigme Gyalwai Nyugu (1765-1843) was the illustrious disciple of Rigzin Jigme Lingpa. 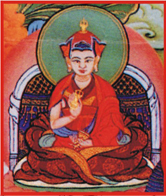 Rigzin Jigme Lingpa had three principal disciples, Jigme Gyalwai Nyugu, Jigme Trinlay Woeser and Jigme Kundrol. 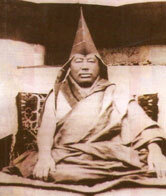 Among them, Jigme Gyalwai Nyugu was the main Dzogchen lineage holder. After spending a considerable time with his master in central Tibet, he returned to Kham. There he practiced and realized the actual nature of mind. 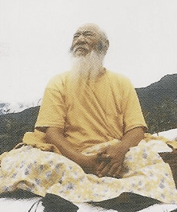 He spent 21 years in the same place and gathered many thousands of disciples, the mains ones were Dza Patrul Rinpoche and Jamyang Kyentse Wangpo Rinpoche. Through those two great disciples, his lineage, the practicing lineage of the Pith-instruction of Dzogpa Chenpo, spread widely. 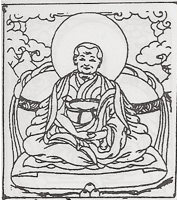 Patrul Rinpoche (1808-1887) was the incarnation of Shanti Deva and the principle disciple of Jigme Gyalwai Nyu-gu. He received all the Nyingtik teachings, transmissions, and whispered pith instructions from his master. He also received other Dzogchen teachings from many other Lamas, including the first Dodrup Chen Rinpoche. 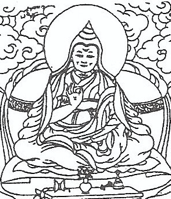 Patrul Rinpoche wrote many commentaries about Hinayana, Mahayana and Vajrayana. His book “Kunsang Lama’i Shelung” (The Words of My Perfect Teacher), the explanation of the Preliminary practice, is well known and widely used by the four schools of Tibetan Buddhism. He had many famous students through teaching and practice, including Jamgon Mipham Rinpoche., who wrote more than thirty volumes about Tibetan Buddhism philosophy. 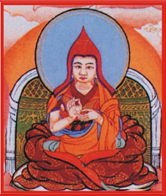 Among all the students, Lama Longtok was the best, to whom Patrul Rinpoche gave pith-instruction of Dzogpa Chenpo. 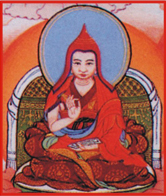 Lungtok Tenpai Nyima (1829-1901) was the foremost disciple of Patrul Rinpoche for twenty five years. 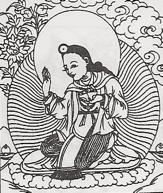 He received all the teachings, initiations and practical instruction of Longchen Nyingtik from his master, and practiced for many years. 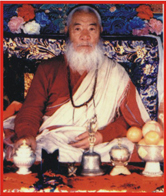 According to his prediction of his master, he started to teach Dzogchen in his fifties. 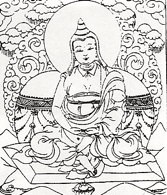 Eventually, Lungtok had five great disciples, among them Khenpo Ngawang Palsang was the supreme one. The supreme manifestation of Padma Sambava's (Lotus Born Buddha) mind. The holy son, blessed by Vimalamitra. Born in the Ox year, by the name of Sangye Dorjee. Will spread the lineage of Vajrayana practice. 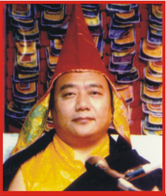 Jadrel Rinpoche received many special teachings, instructions, and initiations from many great masters; among them Khenchen Ngawang Palsang was the main master from whom he received all the innermost secret Dzogchen teachings, instructions and initiations. He practiced and realized the nature of mind and became one with his master. 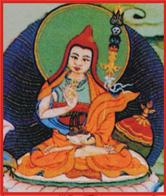 So Jadrel Rinpoche was the main lineage holder of Kama. Terma, Terser, and especially Dzogpa Chenpo Longchen Nyingtik, Dudjom Terser, Sera Khandro's Treasures and Zogchen Rigzin Sogdrub. Jadrel Rinpoche always live in quiet and peaceful places, which is free from worldly activities and politics. All his activities have been in practicing and giving teachings. H.E. Rigzin Dorjee Rinpoche was born on 1954 and at the age of fifteen Rinpoche was ordained monk and studied at the Higher Buddhist Institute in Varanasi. He graduated with the degree of “Acharya”, master in philosophy. In his earlier ages, Rinpoche received many empowerments and teachings from H,H.The Dalai Lama, Kyabje Dudjom Rinpoche, Kyabje Dhilgo Kyentse Rinpoche, Kyabje Penor Rinpoche, Nyingma Khenchen Palden Sherab, Khenchen Dhaser, Khenchen Khasdrub, Khenchen Wanglo, Kyenchen Tsundue, Kagyud Khenchen Yeshi Chodar, Sakya Khenchen Rinchen, Gyelug Khenchen Tsultrem and many other masters in all four schools of Tibetan Buddhism. Through many years of study and meditation retreat, he has mastered the three Tripitakas and the four sections of yoga, and received the honor of Khenpo at the age of 25. Especially, Rigzin Rinpoche received the complete Dzogchen teachings, initiations, pith instructions from his root Guru Kyabje Jadrel Rinpoche and also from Dilgo Kyentse Rinpoche. He was acknowledged by Jadrel Rinpoche as his heart son, and was being compared as equal to himself and other Dzogchen masters in the lineage. Advised him to teach Dzogchen to his students and all over the world. Rigzin Rinpoche devotes all his life to Buddhist education, with emphasis on both philosophical understandings and actual Dharma practices. Since 1988, Rinpoche has founded a Nyingma Institute and Retreat Centers. 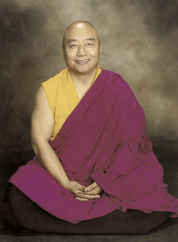 In 1998, Rinpoche founded Longchen Nyingtik Institute, USA. He has also taught extensively in institutions, universities and other Buddhist centers in Bhutan, Nepal, India, Canada, the Netherlands and USA. His wish is to bring peace and the enlightenment to all over the world.